I joined SKC in 2018 and serve as an instructor in the Fisheries and Wildlife Program. I am passionate about environmental conservation, education, and the advancement of tribal peoples. Working at SKC is a dream come true! 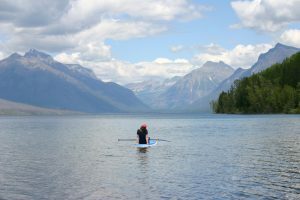 Prior to joining the SKC team, I worked as an environmental consultant, educator, and researcher for a variety of agencies including the Confederated Salish and Kootenai Tribes, University of Montana, National Park Service, EPA, and FEMA. I have also served as an elementary, middle school, and high school teacher. I am particularly interested in aquatic ecosystems. My research has evaluated groundwater and surface water interactions in Glacier Park as well as macroinvertebrate assemblages across river floodplains. More recently, my advocacy has focused on the emerging threat posed by aquatic invasive species to the Flathead watershed. I have been married for 23+ years to a wonderful fella and we are the proud parents of one daughter, Elizabeth. I pursue a variety of hobbies with more enthusiasm than skill, but my feet most often carry me onto local trails or find their way into rafts, canoes, and any other vessel that will get me on the water.